TEDx Sonoma County will bring together leading thinkers and doers to explore multiple perspectives on the theme, Trending Now. We’ll imagine a world where we will be more connected than ever before. How will our lives be richer beyond our imaginations as our devices, our homes and our societies become connected in new ways? Where will we embrace new technology, making the quality of our lives and the world a better place? Where will we push back preferring older ways of doing things, and why? 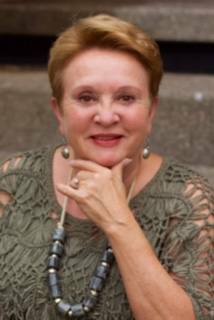 Karen Bergin is the Co-chair of TEDx Sonoma County 2015. She was a commercial banker with Union Bank for 20 years and a member of the management team in their Santa Rosa office for 10 years. Presiding: President Doug asked Debi Zaft to lead us in the pledge. 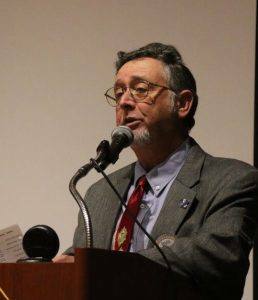 Past President Mark Burchill then recited a few famous quotes from the loveable and recently passed Yogi Berra. No visiting Rotarians were present this day. Today’s guests were Mark’s wife, Mel Konrad and Kerrie Chamber’s guest, Susan Shosky. Cathy has volunteered to explain this joke in explicit detail at our next meeting to those who don’t get it. With $322 in the pot and about half the numbers gone, the odds are increasing for a big payday for some lucky Rotarian. 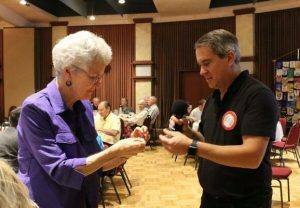 Past President Peggy Soberanis tried, but only ended up with the $10 consolation prize. Remember, you can’t win if you don’t enter! President Doug – Reminded us of the little note cards we wrote a name on. 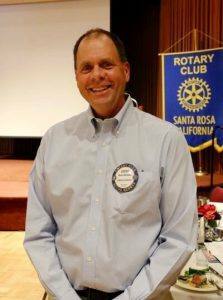 Have you talked to that person about Rotary? HAVE YOU? Pres. Doug also reminded us that we can sponsor a girl to go to Razia’s school for $25 per month. Vicky Hardcastle announced that the matching funds are still available from the Foundation for Paul Harris contributions. Between $100 and $300. A reminder that our club is hosting the SCARC meeting at Rosso Rusticeria & Eventi on Thursday, October 29th. Our president would love to see a big turnout of our club members. Pres. Doug also discussed having 8-12 year olds as an advisory committee to the board – that should be fun and interesting. He also announced that Windsor Rotarian and caterer Peggy Ball provided the snacks at the Razia program gratis. If you need a caterer, this writer recommends Peggy who is both a great Rotarian and a great caterer! Casey D’Angelo was recognized by Pres. Doug for his recent trip to see the Sox in Fenway (Doug set him up with great seats from the look of it!) as well as bicycling through New England and Newfoundland. Casey brought back a baseball as a thankyou gift to Doug. Casey also donated $50 to the club. Sticking with the baseball theme, Pres. Doug called on Mike “Go Cubs” Kallhoff who paid $20 to the club for his Cubs finally catching up to the odds and winning a playoff series. Steve Olson donated $100 to the Foundation for some thing or another. Steve Baime was called on to pay up for his 10th anniversary and gave $50 to the Foundation. 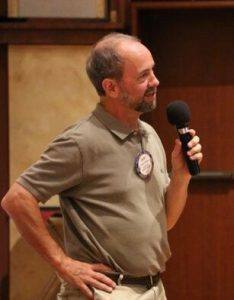 Paul Hamilton celebrated his 33rd anniversary by donating $33 to Polio Plus. Elizabeth Karbousky recently went to Chicago and while there watched the Cubs and White Sox. For this lack of allegiance to one team or the other, she was fined $50 to the Club. Larry Miyano celebrated his 35th anniversary and paid $100 to his Paul Harris. Gary Vice spent a week in New York City and paid $100 to the Foundation. Darrell Horn has been busy winning the long jump in the Huntsman Games in Utah, and going on a variety of trips and cruises. He paid $50 each for a total of $200 to the club! Cathy Vicini went to see Disney on Ice in Oakland and ended up getting caught in the Oakland Raider game hoopla, got stoned and drunk at a tailgate party in the parking lot, and somehow ended up in the Black Hole screaming “Where’s Heidi?” at the top of her lungs wearing a spiky black outfit that would make Gene Simmons proud. For this mini vacation in Oakland, she paid $300 to Paul Harris which we assume he used to bail her out of jail……..
Our own Steve Marburger presented an interesting and informative look at the rapid changes happening in IT, personal computing, and especially Microsoft’s new Windows 10. Steve noted that after Windows 7, Microsoft produced Windows 8 and 8.1 to a less than enthusiastic client base. Steve says that Windows 10 is an improvement, but recommends waiting until the bugs are worked out before making the switch. Pipeline Information Technologies endorsees Windows 10. however you must prepare for the upgrade. Check with your printer vendor for Windows 10 compatibility. Make sure your software is Windows 10 compatible. Windows 10 can be upgraded for free if you are currently using Windows 7 Windows 8 or 8.1. This will expire next July 29th. If you have any questions contact Steve Marburger at steve@pipelineit.net.